Globotech Enterprises incepted in the year 2012 and is engaged in exporting a variety of products which includes food products and confectionery food products, Chocolate Cream Biscuits, Instant Food Products, Glucose Biscuits, Sweet Biscuits, Cream Biscuits, Coconut Biscuits, Fruit Cream Biscuits, Chocolate Cream Biscuits, Milk Biscuits, Milk & Honey Biscuits, Honey Biscuits, Cashew Nut Biscuits, Instant Food Mix, Instant Food Items. We have carved a niche as one of the topmost Confectionery Products Exporters and Suppliers from India. Also we have established long-term business relation with our clients as well as our prospective buyers. It has always been our policy to continuously expand our activities in export operations. With this aim we have progressed tremendously and we now own a fully furnished indenting house dealing in all types of food product. We are engaged in exporting a wide variety of food products. Our products which speaks volumes about the quality of our range. With appropriate packaging the quality and nutrition of the food are maintained. We are using International Standard Quality Packing material for packing our all food product, thus the quality and freshness will maintain for a long time. Our packing is looking more attractive and easy to sell the product in the market. In order to maintain our stance in the industry and offer qualitative range to our clients we possess a fully-furnished warehouse. 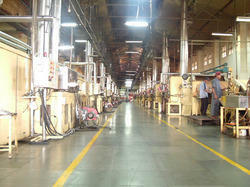 We have installed our warehouse with latest machines and equipment along with sophisticated testing amenities. All these facilities assist us in maintaining our stance in the international arena. The temperature of the warehouse is controlled according to the requirements of the products and our products are stored in an orderly manner. This helps in packaging and shipment of our range. The materials used in the packaging of our range are selected as per the requirement of individual product. Thus, it retains the original quality of the products and keeps the products tamper proof. Our team comprises of adept workforce possessing extensive knowledge and understanding in various spheres of their domain. These are professionals possess experience, expertise and extensive knowledge in their chosen domain; this amalgamates with their assiduousness and establishes us as a force to be reckoned with. Thus, we are enabled us to offer high quality food products that are in accordance to the requirements our valued clients. To enhance the talent and skill of our professionals, we create and encourage a congenial atmosphere. Our professionals work in close proximity with our clients to understand their requirements and offer solutions accordingly. Moreover, the expertise of our professionals and their commitment towards providing consistent quality in our range enables us to successfully meet the demands and requirements of our clients.